Let us imagine two tone-generating points surrounded by circles of equidistant waves. 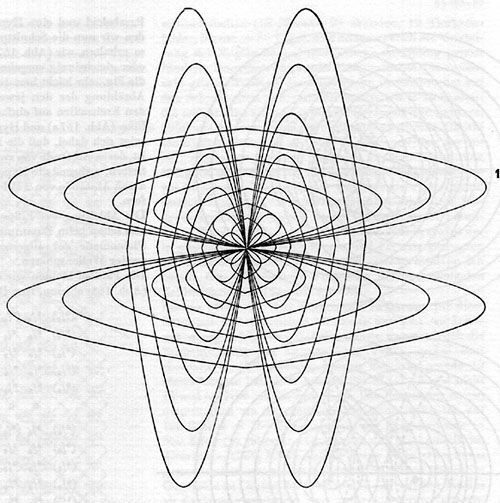 At some point, depending on the distance between the points, these circles of waves will intersect. In reality, of course, they will always be spheres, but projection on a plane is sufficient to discover the laws by which these intersection points occur. One must then simply imagine the relevant figures transposed into the spatial realm, turning an ellipse into an ellipsoid, a parabola into a paraboloid, and a hyperbola into a hyperboloid. If we connect the intersection points of the two groups of concentric circles, we will trace out ellipses or hyperbolas (Fig. 167), depending in which direction we proceed. Since Fig. 167 is very easy to draw, the reader can derive the formula of the ellipse (Fig. 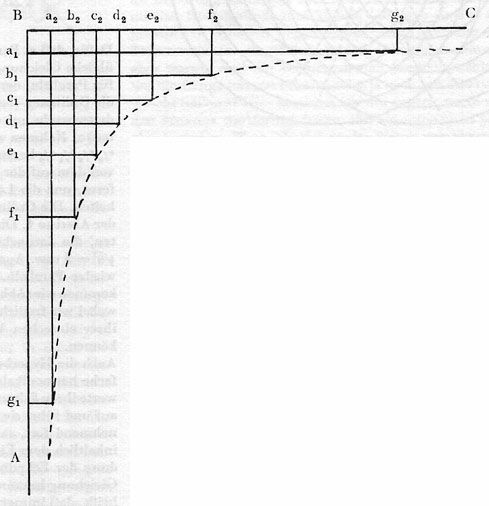 167a) and the hyperbola (Fig. 167b) by counting off the radii that generate the respective intersection points. This shows that the ellipse traces all the points for which the sum of their distance from A and their distance from B is equal, while the hyperbola traces all the points for which the distance from A minus the distance from B is equal. 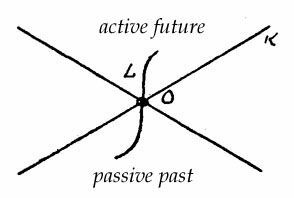 We have thus achieved the derivation of the ellipse and the hyperbola through the intersection of two fundamental phenomena of general vibration theory: the two wave-spheres. Here is the proof that they are parabolas: the familiar parabola equation x2 = 2px changes into y2 = x for a parabola whose parameter is 1/2, i.e. the y-coordinates (perpendicular lines) are equal to the square roots of the corresponding x-coordinates (parallel lines). For the parabola 0/6 5/5 8/4 9/3 8/2 5/1 0/0 in Fig. 168, 5/1 is the perpendicular line 2 units away from the point 5/3 on the x-axis, and the length of the x-line 9/3-5/3 contains 4 units. The y-value 2, then, is the square root of the x-value 4. The x-value 0/3-9/3 has 9 units as its axis, the corresponding y-value 9/0-9/3 = 3 units. √9 = 3, etc. The apexes of these parabolas generate further parabolas. We obtain a beautiful image of these parabolas (Fig. 170) from their fourfold combination, anticipating what will be further discussed in §32. As we saw above, the hyperbola is the geometric location for all points for which the difference between the x- and y-coordinates is the same. Thus we can also explain their “harmonics,” as in Fig. 172. The law of hyperbola construction therefore shows us an increasing arithmetic series (1/n 2/n 3/n 4/n ...) and a decreasing geometric series (harmonic n/1 n/2 n/3 ...)-a precise analogy to the intersecting major-minor series of our diagram. And if we consider, moreover, that the ellipse is the geometric location for all points for which the sum of two distances has an unchanging value, then it is easy enough to construct the ellipse harmonically with reciprocal partial-tone logarithms, since their sum is always 1-for example, 585 g (3/2) + 415 f (2/3) = 1000. In Fig. 174, this tone-pair is drawn with a thick line and marked for clarification. We mark two focal points 8 cm apart (Fig. 174) for the construction of the ellipse, draw one circle around one focal point at radius 5.9 cm (585 g) and one around the other at radius 4.1 cm (415 f), then trace the intersection points of each pair of rays, up to the point where the two shorter f-rays intersect with the circumference of a small circle drawn around the center of the ellipse, and the two longer g-rays intersect with the circumference of a larger circle drawn around the center of the ellipse. These two outer circles, whose radii are of arbitrarily length, serve simply to intercept the vectors (directions) of the single tone-values and to distinguish them clearly from one another. All other points of the ellipse are constructed in the same way. The tone-logarithms here were simply chosen in order for the construction of the ellipse points to be as uniform as possible. If the reader has a good set of drawing instruments, then he can use all of index 16 for point-construction-a beautiful and extremely interesting project. In this case it would be best to use focal points 16 cm apart, and to double the logarithmic numbers. Even if this construction of an ellipse from the equal sums of focal-point rays is nothing new and can be found in every elementary textbook, its construction from the reciprocal P-logarithms still gives us an important new realization. 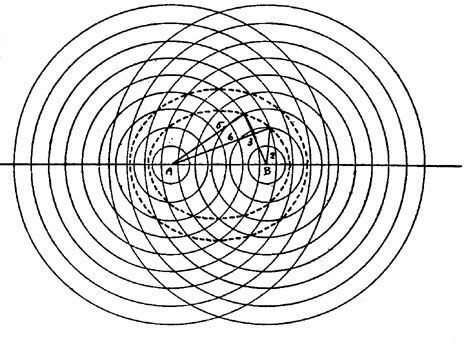 As one can see from the opposing direction of rays in the ratio progression of the outer and inner circles, the tones are arranged here in each pair of octave-reduced semicircles, and thus the directions of the ratios of the two circles are opposite to each other. From the viewpoint of akróasis, then, there are two polar directions of values concealed in the ellipse: a result that might alone justify harmonic analysis as a new addition to a deeper grasp of the nature of the ellipse. Parabola, hyperbola, ellipse, and circle (in §33 we will discuss the harmonics of circular arrangements of the P) are of course conic sections, i.e. all these figures can be produced from certain sections of a cone, or of two cones tangent at their apexes. 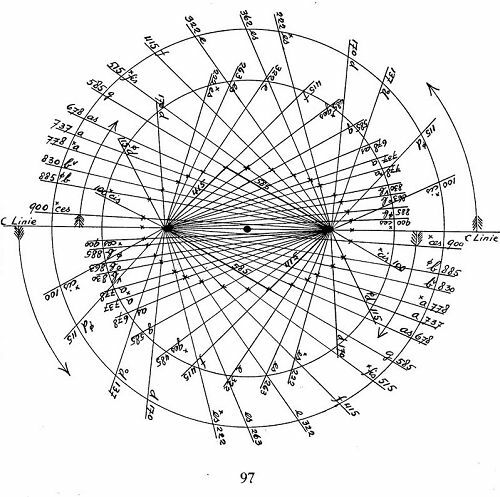 The above harmonic analyses, of which many more could be given, show that these conic sections are closely linked to the laws of tone-development, which supports the significance of the cone as a morphological prototype for our point of view. In pure mathematics, this significance has been known since Apollonius, renewed by Pascal, and discussed in De la Hire's famous work Sectiones Conicae, 1585 (the reader should definitely seek out a copy of this beautiful volume at a library), right up to modern analytical and projective geometry. For those interested in geometric things and viewpoints, hardly anything is more wonderful than seeing the figures of these conic sections emerge from an almost arbitrary projection of points and lines, aided only by a ruler. For a practical introduction see also L. Locher-Ernst's work, cited in §24c. Mathematically speaking, ellipses, parabolas, and hyperbolas can be defined as the geometric location of all points for which the distance from a fixed point (the focal point) is in a constant relationship to the distance from a fixed straight line (the directrix). On this rest the projective qualities of conic sections and the possibility of constructing them by means of simple straight lines (the ruler). 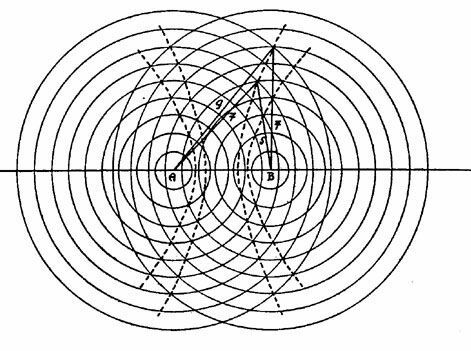 In detail, as remarked above, these “curves of two straight lines” have many more specific harmonic attributes-for example, the octave relationship (1 : 2) of the areas of a rectangle divided by a parabola, the graphic representation of harmonic divisions in the form of hyperbolas, etc. 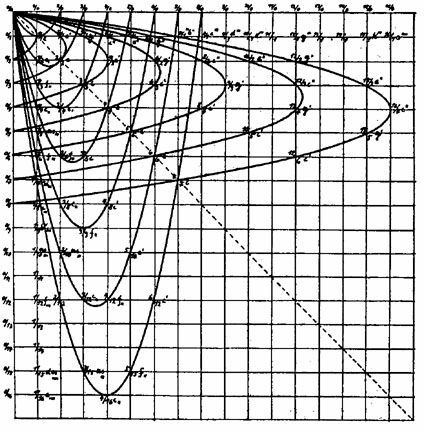 One obtains the “natural logarithm” when one applies the surface-content enclosed by the hyperbola between the two coordinates (F. Klein: Elementarmathematik vom höheren Standpunkt aus, 1924, p. 161); thus, a close relationship also exists between the conic sections and the nature of the logarithm. The applications of the laws of the conic section are many, especially in the exact natural sciences. I will mention only the Boyle-Marriott Law, which connects the respective number-values of pressure and volume, and in which the hyperbola emerges as a graphic expression (and thus the pressure : volume ratio of the reciprocal partial-tone values 4 : 1/4, 2 : 1/2, 1 : 1, 1/2 : 2, etc. are expressed most beautifully). I am also reminded of the “parabolic” casting curves in mechanics, the properties of focal points, parabolas in optics, the countless “asymptotic” relationships, etc. Admittedly, these applications are mostly obscured by differential and integral calculus, though doubtless simplified mathematically-in other words, the morphological content of conic sections is outwardly diminished in favor of a practical calculation method, but remains the same in content. 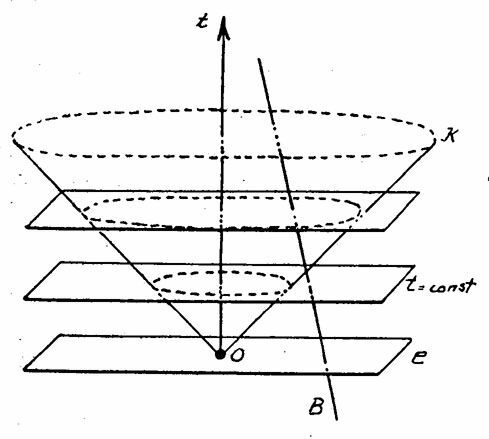 Because of this, it is not astonishing when a figure such as a cone, from which all these laws flow as from the source of an almost inexhaustible spring of forms, is applied emblematically even in the most recent deliberations of natural philosophy, as a direct prototype for the “layers of the world” and for our “causal structure.” In Figures 175a and b I reproduce the diagrams from H. Weyl: Philosophie der Mathematik und Naturwissenschaft, 1927, pp. 65 and 71, which speak for themselves. Thimus: Harmonikale Symbolik des Alterthums, 4th part. H. Kayser: Hörende Mensch, 65, 66, 126, and familiar geometry textbooks.